Lewis County, named after Meriwether Lewis of Lewis and Clark fame, has a variety of methods to research and acquire copies of records for the area. 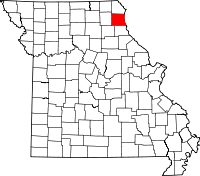 The Lewis County Historical Society operates a museum at 112 North 4th Street in the town of Canton, MO. The museum has volunteers on hand who are available to assist with research projects on Tuesdays and Thursdays from 8:00AM until 3:00PM; appointments for all other days except Sunday can made scheduled by calling (573) 288-5713. Also in Canton at 106 N 5th St in #2 is the Circuit Clerk's office, in charge of civil and criminal records, and open Monday through Friday during normal business hours. In Monticello, the county seat, are both the Lewis County Health Department and the Recorder of Deeds. The former is responsible for indexing and distributing birth and death certificates, while the latter handles property and marriage records.